The injuries to Lindsey Witten and Mike Hicks aren't believed to be serious. Edsall expects them both to be back by Saturday. Receiver Kashif Moore didn't practice as a precaution with a tweaked hamstring. Erik Kuraczea is back at practice after having "his bell rung" last week. Kijuan Dabney was hurt during a blitz drill Wednesday. His status is unknown, pending more examinations, but in the meantime David Kenney has been moved up from defensive back to back-up Husky position. He'll remain there as long as Dabney is out. Michael Smith's grandmother passed, and he left campus to attend her funeral. Linebacker Jerome Williams suffered a burst appendix earlier in the summer, and underwent a difficult surgery that was touch and go. He is slowly working his way back, and will be limited much of this fall. Those who were at practice got to see how exciting a player Dwayne Difton really is; the rest of you will be pleasantly surprised this season. Difton evoked images of Donald Brown by stiff-arming Jasper Howard to the turf on one play. Howard got up and drilled Difton, who was already out of bounds, with Difton laughing at his "big brother". Howard has taken Difton, a fellow south Floridian, under his wing, and the two have become close. "It's the same thing Darius Butler did with me," Howard said. "I want to make him feel at home." Still, the pair like to go at it in practices. Howard has been impressed with Difton's ability. "Whatever he was, 4-star, 5-star, he's living up to the billing," Howard said. "He's doing a tremendous job." I, for one, keep forgetting Howard isn't a captain. He's such a natural leader, and has really been working with many of the younger players, not just Difton. He also wants to keep the UConn cornerback tradition of heading to the NFL alive. Bigger and stronger this fall, Howard also seems faster. "I can't slack off," Howard said, speaking about leadership as well as pro aspirations. "Tyvon did it, Darius did it. It's up to me and Reggie." There was a full referee crew on hand for today's practice, and if I didn't know better I swear the umpire was Tom Morello, the guitarist from Rage Against the Machine. Could have been his twin brother. Michael Box and Cody Endres got more action this afternoon simply because it was the second session of the day, so Zach Frazer got a bit of a break. Both looked good, Box in particular. He seems to be a heady player with lots of potential. Netflixed Iron Maiden: Flight 666 last night (which I watched by myself...the wife isn't as enamoured with 80s metal as I am). Great documentary. Iron Maiden is truly a global band, drawing crowds in excess of 100,000 for concerts in places like India, Costa Rica, Mexico and Columbia. In Brazil and Argentina, the band is revered as true rock gods. They were greeted by tens of thousands of fans both at the airport and hotel...incredible. 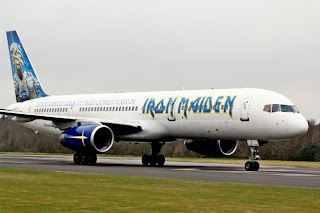 The coolest part is lead singer Bruce Dickinson is also a commercial airline pilot, and personally flies the group and their entire road crew and equipment on a customized 757, known as Ed Force One. Worth watching if you're into that kind of thing. If not, I'll stop now. 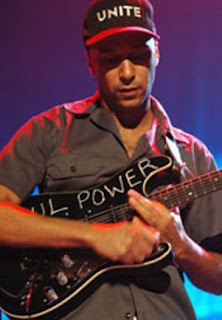 Lol Tony Morello...it's Tom Morello, but good job other than that. I'm looking forward to the Huskies starting their season up again.